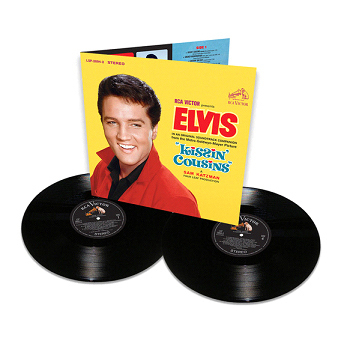 FTD VINYL is please to announce the release of Kissin’ Cousins as a limited edition 2xLP set. The album contains great alternative versions of songs from the film soundtrack sessions and related tracks. Mastered at Abbey Road Studios, the album is released in 180 gram format. As part of the 50th anniversary of the 1968 Comeback special campaign, The King In The Ring LP Vinyl format will be released (standard Black LP Vinyl format) at the end of November 2018. 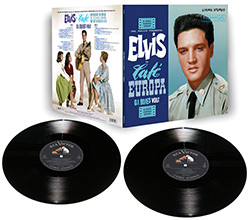 FTD is please to announce the release of Elvis – Café Europa – GI Blues Vol. 2 limited edition. This double vinyl album contains more great outtakes from the GI Blues soundtrack sessions. Mastered at Abbey Road Studios, the album is released in 180 gram format. Disc 1 – Side 1: GI Blues (take 6) / Tonight Is So Right For Love (take 8) / What’s She Really Like (takes 14-16) / Frankfort Special (remake, takes 9-10/M) / Pocketful Of Rainbows (version 1, take 17) / Tonight’s All Right For Love (take 6) / Wooden Heart (‘Gramafunken version’- instr.). Side 2: Doin’ The Best I Can (takes 10-12) / Shoppin’ Around (takes 1, 2) / Whistling Blues (instrumental) / Pocketful Of Rainbows (version 1, takes 26-28) / Tonight’s All Right For Love (takes 7-8) / Big Boots (fast version, takes 6, 5). 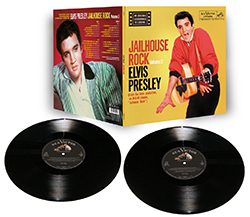 FTD Vinyl is please to announce Jailhouse Rock – Volume 2 as a limited edition release. The album contains excellent Binaural outtakes of Jailhouse Rock, Treat Me Nice, Baby I Don’t Care and others. Mastered at Abbey Road Studios, this album is released in 180 gram format. 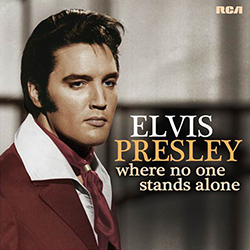 We are thrilled to share that the next Sony Music CD & vinyl Elvis project, Where No One Stands Alone, released on August 10th 2018. SIDE ONE: I’ve Got Confidence / Where No One Stands Alone (with Lisa Marie Presley) / Saved / Crying In The Chapel / So High / In The Garden / Bosom of Abraham. SIDE TWO: How Great Thou Art / I, John / You’ll Never Walk Alone / He Touched Me / Stand By Me / He Is My Everything / Amazing Grace. 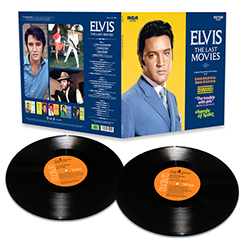 FTD is please to announce the release of Elvis: The Last Movies on limited edition vinyl. The album collects all the soundtracks from Live A Little, Love A Little, Charro!, The Trouble With Girls and Change Of Habit. Mastered at Abbey Road Studios, the album is released in 180 gram format. SIDE ONE: A Little Less Conversation (takes 11, 12, 16 – Single Master]) / Wonderful World (takes 16, 17 – Master) / Edge Of Reality (take 8 – Master) / Almost In Love (track 2006 take 4 and vocal overdubs 2012 takes 2, 3 – Master). SIDE TWO: A Little Less Conversation (takes 1, 2) / Wonderful World (takes 2, 3) / Edge of Reality (take 3) / Wonderful World (take 7 – Movie master) / A Little Less Conversation (take 10 – Album master) / Edge Of Reality (takes 5, 6 – Alternate master). SIDE THREE: Charro! / Let’s Forget About the Stars (Rough mix) / Clean Up Your Own Back Yard / Swing Down Sweet Chariot (Female vocals and brass overdub) / Almost / Signs Of The Zodiac (Duet with Marlyn Mason) / College Songs Medley (Far Above Cayuga’s Waters / Boola Boola / Dartmouth’s In Town Again / The Eyes Of Texas / On, Wisconsin / The Whiffenpoof Song / Fair Harvard / Notre Dame / Violet). SIDE FOUR: Change Of Habit / Let’s Be Friends / Have a Happy / Let Us Pray (alternate vocal overdub) / Rubberneckin’ / Almost (take 29) / Charro! (Rough mix). Memphis Recording Service will release it's 2018 Record Store Day album on 21st April 2018. The LIMITED EDITION, 180 gram vinyl contains the complete New York masters plus outtake session recordings. Bonus 4-Page pullout inside. SIDE A: Blue Suede Shoes / My Baby Left Me / One-Sided Love Affair / So Glad Your Mine / I'm Gonna Sit Right Down & Cry / Tutti Frutti / Lawdy, Miss Clawdy / Shake, Rattle & Roll / Hound Dog / Don't Be Cruel / Anyway You Want Me. This special collector’s edition vinyl offering from Vee-Tone Records, comes in two stunning coloured vinyl options (500 x green vinyl and 500 x orange vinyl). 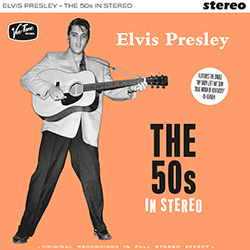 Elvis Presley - The 50s In Stereo features 12 specially selected mono recordings given the NEOPHONIC Stereo makeover. Individually numbered 001 – 500 of each vinyl colour, this limited edition album will not be re-pressed. 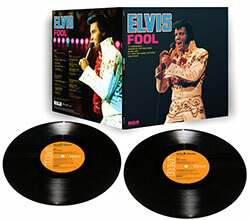 Follow That Dream (FTD) is please to announce the release of Elvis - The Fool Album. Originally released in July 1973, this album’s track listing changed dramatically from RCA’s internal documents circulated just one month before. Here for the first time, Disc 1 features the LP sequenced as ORIGINALLY PLANNED. The LP artwork also replicates the original draft layout before it was amended. Disc 2 includes outtakes from the sessions that contributed to the album. Highlights include the rare fully-orchestrated version of Fool and the 11-minute+ version of Don't Think Twice, It's All Right. SIDE B - Reconsider Baby (Blues Jam)* / Hawaiian Wedding Song* / Ku-U-I-Po* / I’ll Take You Home Again Kathleen / No More*. DISC 2 - The Outtakes And Alternates - Side C: Fool (with full strings overdub) / Steamroller Blues* (single mix) / Until It’s Time For You To Go (takes 1 and 2) / (That’s What You Get) For Lovin’ Me (takes 9 & 10) / I Will Be True (takes 1 and 2). SIDE D - Don’t Think Twice, It’s All Right + (take 2, informal recording) / Love Me, Love The Life I Lead (alternate mix) / It’s Still Here (takes 4 and 5). 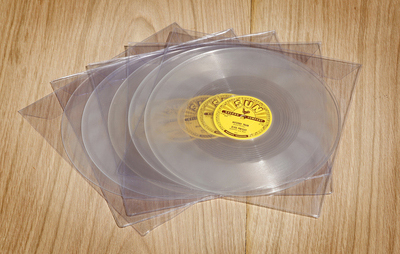 These five magnificent Sun 10" replica singles play at 78rpm. This is the first time since Elvis Sun replicas produced in the 1970's, that they have been made to play the original 78rpm speed. Since then some were only made at 45rpm. Each of the 5 Sun replicas have the original etched numbers included with the appropriate song sides and are by far the most original Sun replicas made. All the labels are perfect (as the original) in size, accuracy, and colour. The sound quality is excellent with the original Sun sound recordings (including That's All Right) and is pressed on heavy stock vinyl. This is a strictly low limited number release of a CRYSTAL-CLEAR version in a clear polybag. 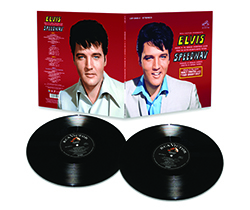 A first time ever in this version for any Elvis Sun single replica produced. 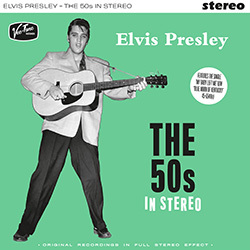 A Limited 150 gram vinyl LP pressing that includes includes Elvis' complete single A and B-sides for Sun Records, plus additional songs recorded at Sun Studio and released on his landmark self-titled debut album in 1956. This is the story of Elvis Presley before he becomes world-famous, and how this amazing young man readies himself for stardom, achieving success on a level that no one could have dreamed possible. / I Forgot to Remember to Forget. Side 2 - Mystery Train / I Love You Because / Blue Moon / I'll Never Let You Go (Little Darlin') / Just Because / Trying to Get to You / Tomorrow Night / Harbor Lights. 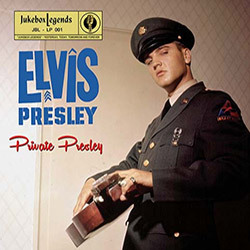 This Private Presley 2xLP vinyl was specially released at the Elvis Presley Festival in Bad Nauheim. 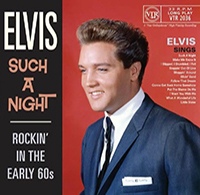 The tracklisting features tracks released during Elvis' army period and includes some home recordings and post army tracks. 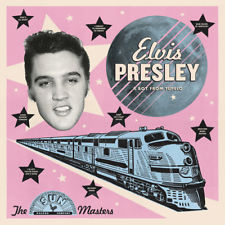 SIDE A - Tracks Released During The Army Period - Wear My Ring Around Your Neck / Doncha’ Think It’s Time / Hard Headed Woman / Don’t Ask Me Why / One Night / I Got Stung / I Need Your Love Tonight / (Now And Then There’s) A Fool Such As I. SIDE B - A Big Hunk O’ Love / My Wish Came True. Home Recordings, May 1958 - Eddie Fadel - Waco, Texas - Sail Along The Silvery Moon / I Understand - Happy Happy Birthday Baby #1 / Happy Happy Birthday Baby (Incomplete Solo) / Just A Closer Walk With Thee. The German Home Recordings (Newly Found) - Guitar Solo / I’m Beginning To Forget You. SIDE C - I Asked The Lord (Take 1) / I Asked The Lord (Take 2) / Apron Strings (Take 1) / I Asked The Lord (Take 3) / I Asked The Lord (Take 5) / I’ll Take You Home Again Kathleen (Slow)* / Que Sera - Hound Dog* / I’ll Take You Home Again Kathleen (Take 2 - Fast)* / Send Me Some Lovin’*. SIDE D - Post Army Sessions: Stuck On You / Soldier Boy (Take 11) / I Will Be Home Again / GI Blues (Take 4 & Composite Master) / Tonight Is So Right For Love (Take 4) / Frankfort Special (Take 8 Up-Tempo) / Wooden Heart (Take 4 - Master). Based on the original 1981 Guitar Man album, FTD Vinyl’s new release contains all the tracks featured on the FTD CD release from 2000. The 2xLP set features full overdub session data insert. Pressed on 180 Gram heavyweight vinyl, it’s availability is strictly limited as are all previous FTD vinyl releases. SIDE 1 - If You Talk In Your Sleep / Just Call Me Lonesome / I’ll Be There / Too Much Monkey Business / After Loving You / You Asked Me To. SIDE 2 - Faded Love / Clean Up Your Own Backyard / Lovin’ Arms / Guitar Man / Kentucky Rain / In The Ghetto. SIDE 3 - Burning Love / I’ll Hold You In My Heart / Only The Strong Survive / She Thinks I Still Care / Long Black Limousine. SIDE 4 - I’m Movin' On / Hey Jude / Blue Suede Shoes. 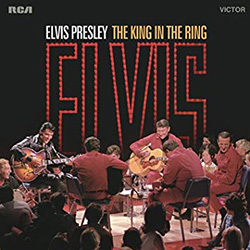 BONUS SONGS: Paralyzed* / The Elvis Medley+ Jailhouse Rock - (Let Me Be Your) Teddy Bear) - Hound Dog - Don’t Be Cruel - Burning Love - Suspicious Minds / Wear My Ring Around Your Neck*. SIDE A - 1. Blue Hawaii (Takes 2 & 3) / Almost Always True (Takes 4 & 5) / Aloha Oe (Master The Surfers + Take 6 Elvis) / No More (Take 8) / Can’t Help Falling in Love (Take 24, version film) / Rock-A-Hula Baby (Take 2 & 3) / Moonlight Swim (Take 1 & 2). SIDE B - 8. Ku-u-i-po (Takes 4 & 5) / Ito Eats (Takes 4 & 5) / Slicin’ Sand (Takes 13 & 14) / Hawaiian Sunset (Take 2) / Beach Boy Blues (Take 3, version film) / Island Of Love (Take 9) / Hawaiian Wedding Song (Take 1). SIDE A - Kiss Me Quick (Take 4) / Just For Old Time Sake (Takes 3 & 4) / Gonna Get Back Home Somehow (Take 5) / Easy Question (Such An) (Take 3) / Steppin’ Out Of Line (Take 15) / I’m Yours (Take 4). SIDE B - Something Blue (Takes 3 & 4) / Suspicion (Takes 2) / I Feel That I’ve Known You Forever (Takes 3) / Night Rider (Takes 1 & 2) / Fountain of Love (Takes 9) / That’s Someone You Never Forget (Takes 7). A stunning 2xLP heavy vinyl set mastered at Abbey Road Studio. Following on from the recent Today - the Original Session Mixes, FTD Vinyl is pleased to announce the this that also features the original MONO mixes. SIDE 1 - Let Yourself Go / Your Time Hasn’t Come Yet, Baby / There Ain’t Nothing Like A Song (Elvis and Nancy Sinatra) / Who Are You? (Who Am I?) / Speedway / He’s Your Uncle Not Your Dad / Suppose. SIDE 2 - Five Sleepy Heads / Going Home (takes 24, 21) / Mine (takes 1, 2, 3, 4) / Western Union (take 1) / Suppose (Nashville master) / Let Yourself Go (take 5). SIDE 3 - Your Groovy Self (master - Nancy Sinatra) / Your Time Hasn’t Come Yet, Baby (movie version) / Goin’ Home (takes 16, 23) / Mine (takes 8, 9) / Western Union (take 2, 3) / Let Yourself Go (take 6). SIDE 4 - The MONO Soundtrack Masters: Speedway / There Ain’t Nothing Like A Song (Elvis and Nancy Sinatra) / Your Time Hasn’t Come Yet, Baby / Who Are You? (Who Am I?) / He’s Your Uncle Not Your Dad / Let Yourself Go / Your Groovy Self (Nancy Sinatra) / Five Sleepy Heads* / Suppose*. The Memphis Recording Service will soon release a 2xLP 180 Gram vinyl set entitled Memphis Recording Service: Masters & Sessions 1953 – 1955 with a bonus 4-page photo insert on the December 16th 2016. SIDE A - Sun Single Masters: That’s All Right (Sun 45rpm Master) / Blue Moon Of Kentucky / Good Rockin’ Tonight / I Don’t Care If The Sun Don’t Shine / Milkcow Blues Boogie / You’re A Heartbreaker / Baby, Let’s Play House / I’m Left, You’re Right, She’s Gone / Mystery Train / I Forgot to Remember to Forget. SIDE B - Sun Masters: Harbor Lights / I Love You Because / Blue Moon / Tomorrow Night / I’ll Never Let You Go / Just Because / I’m Left, You’re Right, She’s Gone (Slow Version) / Tryin’ To Get To You / When It Rains It Really Pours. SIDE C - Personal Recording Acetates: My Happiness (Acetate – Personal Recording August 1953) / That’s When Your Heartaches Begin (Acetate – Personal Recording August 1953) / I'll Never Stand in Your Way (Acetate – Personal Recording January 6th 1954) / It Wouldn’t Be The Same Without You (Acetate – Personal Recording 6th January 1954). Sun Trial Sessions: Harbor Lights (Takes 1FS & 2FS & 4) / I Love You Because (Takes 1FS & 2) / That’s All Right (Takes 1-3). Bonus Tracks (Radio Station Acetates) Shake Rattle And Roll (January 6th 1955 Radio Station KDVA Lubbock, TX / Fool, Fool, Fool (January 6th 1955 Radio Station KDVA Lubbock, TX). SIDE D - Sun Outtakes And Sessions: Blue Moon Of Kentucky (Outtake Part -Slow Tempo Version) / Blue Moon (Takes 1FS & 2FS & 3FS & 4) / Blue Moon (Take 5) / Blue Moon (Takes 6FS & 7FS & 8) / I’m Left, You’re Right, She’s Gone (Takes 3 & 4FS) / I’m Left, You’re Right, She’s Gone (Takes 6 & 7END) / When It Rains It Really Pours (Takes 3FS & 4FS) / When It Rains It Really Pours (Takes 6FS, 7FS & 8LFS). 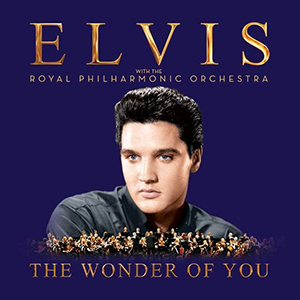 Out on December 2nd 2016, The Wonder Of You: Elvis Presley With The Royal Philharmonic as a deluxe edition boxset with three additional tracks on CD2, a 150 gram LPs in a gatefold package, a poster suitable for framing and a beautiful 12-page booklet. All housed in a 12”x12” lift-off box. 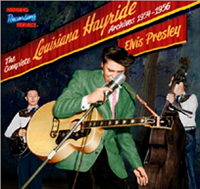 This limited edition 180 gram 2xLP set contains for the first time ever, the complete archival live recordings of the Louisiana Hayride from 1954 – 1956 on vinyl. All of the 33 tracks herein are re-mastered using the most sophisticated technology and include recently discovered material, including a live version of I Forgot to Remember to Forget and a brand new song Little Mama, released for the first time ever on vinyl. The bonus 24-page booklet has many rare and unreleased photographs. It contains extensive linear notes, with informative and historical facts on Elvis’ time with the Louisiana Hayride during 1954 - 1956. Side A: October 16th 1954: Hayride Begins Jingle / Introduction / That's All Right / Blue Moon of Kentucky. January 15th 1955: Hearts Of Stone / That’s All Right / Tweedle Dee. January 22nd 1955: Money Honey / Blue Moon Of Kentucky / I Don’t Care If The Sun Don’t Shine / That’s All Right. Side B: March 5th 1955: Tweedle Dee / Money Honey / Hearts Of Stone / Shake, Rattle & Roll / Little Mama / You’re A Heartbreaker. April 30th 1955: Gladewater, Texas (Remote Louisiana Hayride Broadcast): Tweedle Dee. July­ 22nd 1955: I’m Left, You’re Right, She’s Gone. Side C: August 20th 1955: Baby Let’s Play House / Maybellene / That’s All Right. October 1955: I Forgot To Remember to Forget. 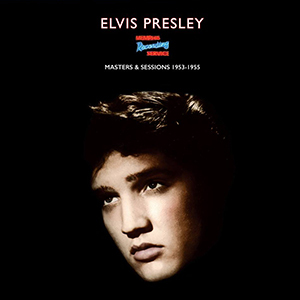 December 15th 1956: (Part 1): Heartbreak Hotel / Long Tall Sally/ I Was the One / Love Me Tender. Side D: December 15th 1956: (Part 2): Don’t Be Cruel / Love Me / I Got a Woman / When My Blue Moon Turns To Gold Again / Paralyzed / Hound Dog / Elvis Has Left The Building. Overseas customers please contact us for overseas postage rate. 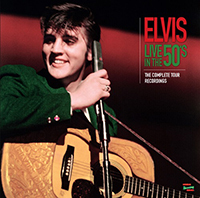 A limited edition 2xLP on 180-gram vinyl presenting Elvis' complete archival live tour recordings of the 1950s. All the 34 tracks are remastered and a recently recovered recording is included as a bonus cut. You also get a 24-page photo album offering many rare pix plus a listing of all the '50s shows (including the Louisiana Hayride). LP 1: March 19th 1955 - Eagles Hall, Houston, Texas: Good Rockin' Tonight / Baby Let's Play House / Blue Moon Of Kentucky / I Got A Woman / That's All Right. Mayth 1956 - New Frontier Hotel, Las Vegas, NV: Heartbreak Hotel / Long Tall Sally / Blue Suede Shoes / Money Honey. May 16th 1956 - Robinson Auditorium, Little Rock, AR: Heartbreak Hotel / Long Tall Sally / I Was The One / Money Honey / I Got A Woman / Blue Suede Shoes / Hound Dog. May 26th 1955 - Jimmie Rodgers Memorial Festival, Meridian, Mississippi: That's All Right (Bonus Track). On March 25th 1961 Elvis performed what would become his final live performance for eight years! The complete recording of that very show is captured here on this limited edition, 180gm, 2xLP set. Also included in the 26 tracks is a vinyl debut of the recently discovered press conference for the show, which was not available at the time of the CD version of this release. As a bonus, the included 24-page booklet is illustrated with many rare large images and extensive, informative linear notes that recall historical facts up to and including Elvis' arrival and performance in Pearl Harbor. Side A: Preview Special: Elvis Salutes the USS Arizona (Radio Broadcast March 18th 1961) / Part 1 - Featuring Take My Hand Precious Lord / Part 2 – Featuring I Believe In The Man In The Sky / Part 3 – Featuring It Is No Secret / Part 4 – Featuring Milky White Way / Part 5 – Featuring He Knows Just What I Need / Part 6 – Featuring I Believe. 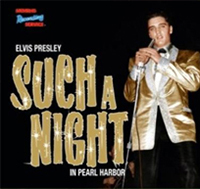 Side C: USS Arizona Memorial Show - March 25th 1961 – 8:30pm – Part 1: Bloch Arena, Pearl Harbor, Hawaii: Intro / Heartbreak Hotel / All Shook Up / (Now and Then There’s) A Fool Such As I / I Got A Woman / Love Me / Introductions / Such A Night / Reconsider Baby. Side D: USS Arizona Memorial Show - March 25th 1961 – 8:30pm – Part 2: Bloch Arena, Pearl Harbor, Hawaii: I Need Your Love Tonight / That's All Right / Don’t Be Cruel / One Night / Are You Lonesome Tonight / It’s Now Or Never / Swing Down Sweet Chariot / Hound Dog. 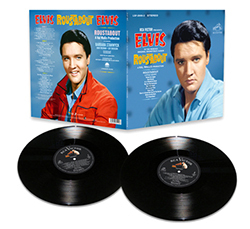 This impressive 10” vinyl album features 12 rockin’ floor-fillers recorded and released by Elvis between 1960 and 1962. 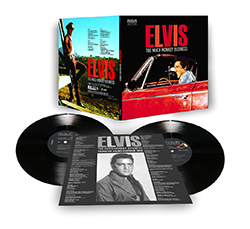 This special collector’s edition is limited to only 1000 copies and brings together some of Elvis’ finest early '60s dancers on one stylish compilation, great sound quality and stunning artwork make this a must have addition to any record collection! 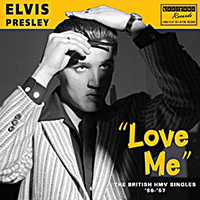 Love Me - The British HMV Singles ’56-’57 is a stunning 12” album bringing together in chronological order, all of Elvis’ electrifying and now highly collectible British HMV (His Masters Voice) singles released between March ’56 and March ’57. This special limited edition of only 500 copies comes in a 180g vinyl format. When Elvis signed his new recording contract in November 1955, taking him from Sun Records in Memphis to national music giant RCA Victor, nobody could have predicted the influence he would have on the course of popular music worldwide. Elvis’ pioneering, early UK singles were released on EMIs, HMV label before being moved by British Decca over to RCA/RCA Victor in 1958. Love Me - The British HMV Singles ’56 - ’57, charts Elvis’ meteoric rise in Britain. 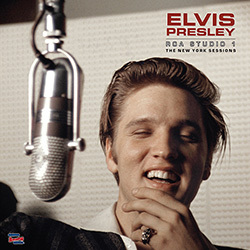 Featuring recordings from Elvis’ Sun Records catalogue and the now legendary RCA ’56 sessions, 16 pure Rock ‘n’ Roll gems, pre-army Presley at his very best! SIDE A: Heartbreak Hotel / I Was The One / Blue Suede Shoes / Tutti Frutti / Want You, I Need You, I Love You / My Baby Left Me / Hound Dog / Don't Be Cruel. SIDE B: Blue Moon / I Don't Care If The Sun Don't Shine / Love Me Tender / Any Way You Want Me / Mystery Train / Love Me / Rip It Up / Baby, Let's Play House.